Nestled at the foot of Vermont's Green Mountains, lies this valuable gem - The Chelsea Royal, a vintage 1938 Worcester Diner. Decor and food speak of times gone by with Daily Blue Plate Specials, generous portions and extremely friendly pricing. The Royal Diners' cuisine is probably best described as "high-end home style". Authentic Mexican Fare served Tuesday through Saturday evenings, Prime Rib Friday and Saturday nights, real mashed potatoes, homemade soups, breads, pies and desser ts. Breakfast is served all day and they are a feast, with homemade pancakes and Belgian waffles, Eggs Benedict, and the Diners' specialty "Cajun Breakfast Skillet" make for some tough choices. The menu also offers an array of sandwiches, pizza, and a kids menu. Take-out is available for every item. April through October is the season for the Royal Soft Serve Stand, featuring Columbo Nonfat Frozen Yogurt, 10 flavors of Soft-Serve daily, and the Royal's Homemade "Royal Madness" Ice Cream. There's lots of classic eats too, such as Footlong Hot Dogs with fries, and Double Cheese burgers. 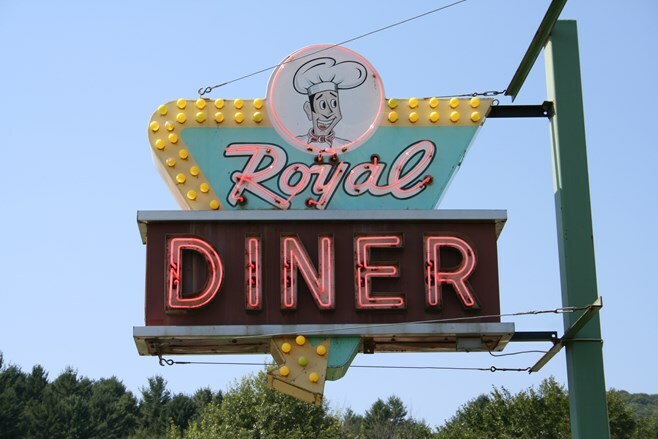 The Royal Diner is treasured by locals and a rare find for travelers! Local Brews & Burgers! Beer on tap: 14th Star Tribute, Switchback, Fiddlehead. Grass-fed Burger Specials every day! Our farm fresh eggs, famous Cajun Skillet Breakfast, Eggs Benedict, Belgium Waffles, Pancakes & daily specials! We are celebrating our 29th year! Come see why! Serving locals & tourists, open for breakfast, lunch & dinner. And don't forget the ice cream! © 2019 Chelsea Royal Diner. All rights reserved. View site map. Chelsea Royal Diner website is served by Flavor Plate.